The tail is the key! 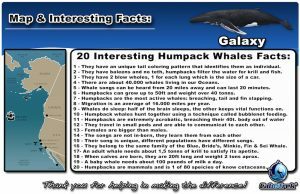 Humpback Research Project: the importance of knowing our Whales! Humpback whale are identified as individuals by the underside of their flukes, or tails. The distinct coloration, shape, and scarring pattern of the fluke’s underside are as unique as a human fingerprint, allowing scientist to distinguish individuals using the pictures they have taken of their flukes. 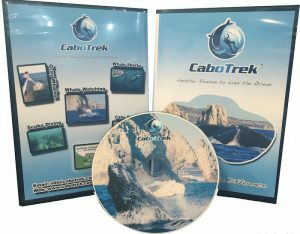 CaboTrek has a photo-identification project in Cabo San Lucas. Every hour spent at sea with whales translates into several of hours of work analyzing data. Photos are carefully analyzed, compared to those of several individuals and finally matched according to a series of rigorous criteria: As a part of your experience on our tours, you will learn how to identify whales as individuals. 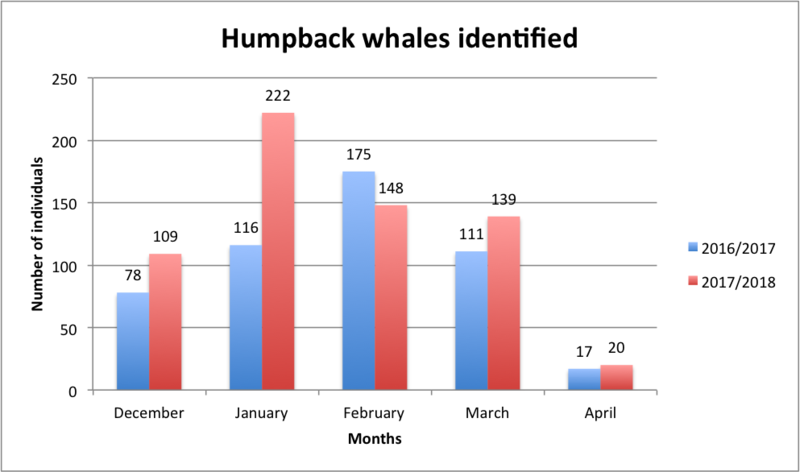 We give each whale we spot an ID – CTHW (for Cabo Trek Humpback Whale) along with their respective number. Some of those whales are known to us and have a nickname in addition to their ID number. 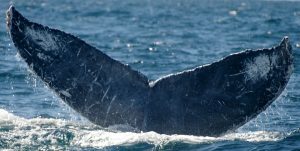 It contributes to a better understanding of the distribution, abundance and dynamics of the Humpback Whales that migrate through the Baja California Sur region. 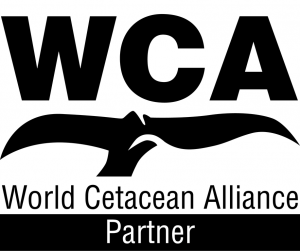 It raises awareness about responsible whale watching and ecotourism practices. with the intent of promoting lasting changes toward preserving and conserving a healthy marine ecology. Not only, we will keep a record of other marine mammals in the area including: dolphins and other species of whales such as the Gray, Blue, Fin, Pilot, Sperm, Bryde’s and Killer whales. Fluke identification photos will primarily help us building a data base of individual Humpback Whales visiting the Cabo San Lucas area and in further instance seeking collaboration with other organizations in Mexico as well as in the U.S. To improve larger existing fluke identification catalogs. 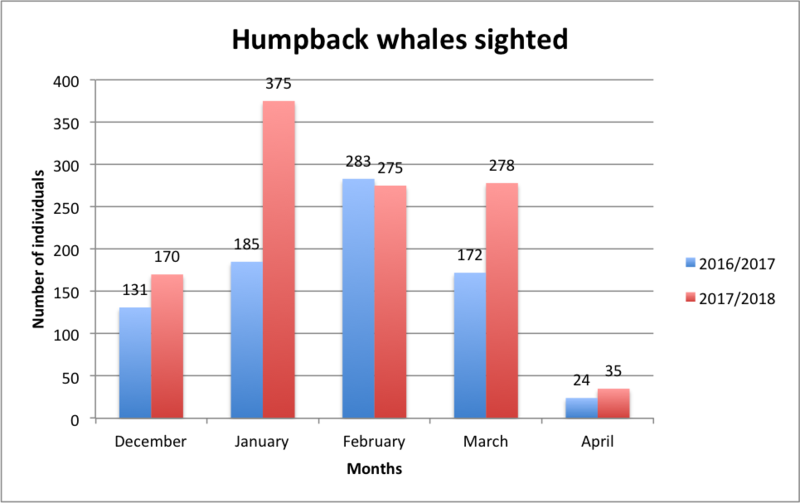 Contribute to the scientific community’s understanding of the Northeastern Pacific Humpback Whale population. Improve larger existing fluke identification catalogs in the North Pacific, we share our pictures with Ted Cheeseman from Happywhale (www.happywhale.com). You can check all our whales sighted and their stories clicking “Record Trip” here. 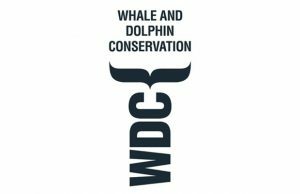 It is our intention to raise awareness regarding best whale watching practices and to contribute to understanding of the dynamics of the Northeastern Pacific humpback whale population in order to improve the conservation plan for humpback whales and the ocean. 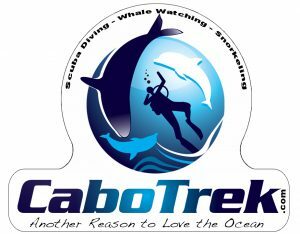 As a Cabo Trek guest you are helping with our research project. 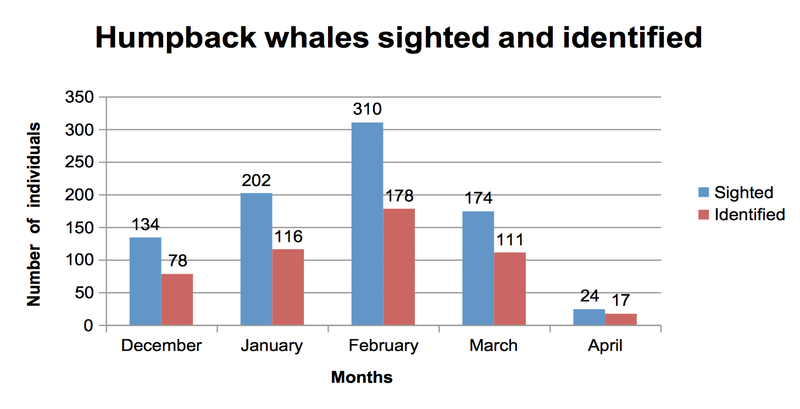 Our catalogue, at the moment, has 657 individual whales collected over the past 4 seasons. CTHW#315 is still our oldest whale with Happywhale considering both breeding and feeding grounds. CTHW#329 this whale is the oldest if we take in consideration only the breeding ground. Match with the Universidad Autonoma de Baja California Sur. CTHW#496 up to date this whale is still the one that travels the most. CTHW#519 no updates to report. CTHW#536 no updates to report. CTHW#315 is our oldest whale. 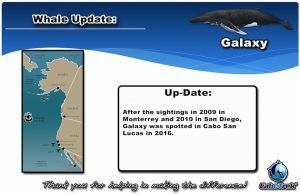 It was sighted for the first time in July 1990 in the Gulf of the Farallones, California and in January 2017 was re-sighted in Cabo San Lucas. CTHW#329 is a whale that survived an orca attack that carried away most of his or her left fluke. 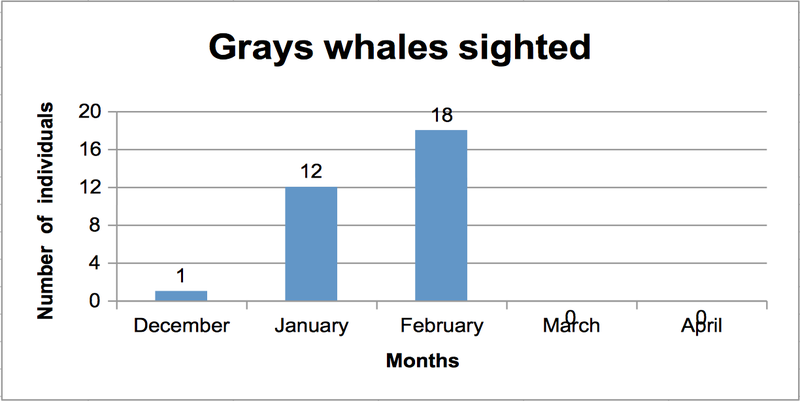 This whale was sighted for the first in November 1993 in the Gulf of the Farallones, California; it was sighted twice in 2009 in Santa Barbara Channel, California; it was sighted twice in 2015 in Monterey Bay, California; in 2016 was sighted once both in Monterey Bay and Moss Landing, California; and in January 2017 was sighted in Cabo San Lucas. CTHW#496, also known as Krusty, is our furthest match. It was sighted once in September 2011 in Kodiak Island, Alaska and in February 2017 in Cabo San Lucas. CTHW#519 is our whale that was re-sighted more times. 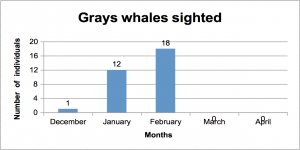 This whale was seen for the first time in August 2009; in 2010, it was sighted six times; in 2011 three times; and in 2012 nine times, always in Santa Barbara Channel, California or nearby this area. In February 2017 was the first sighting for in its breeding ground. CTHW#536 was sighted for the first time in August 2009 in the Gulf of the Farallones, California. In May 2012, this whale was part of a killer whale/ gray whale calf predation. A pod of orca was trying to predate a calf gray whale and few humpback whales were sighted in the same are trying to help the mother and calf gray whale. 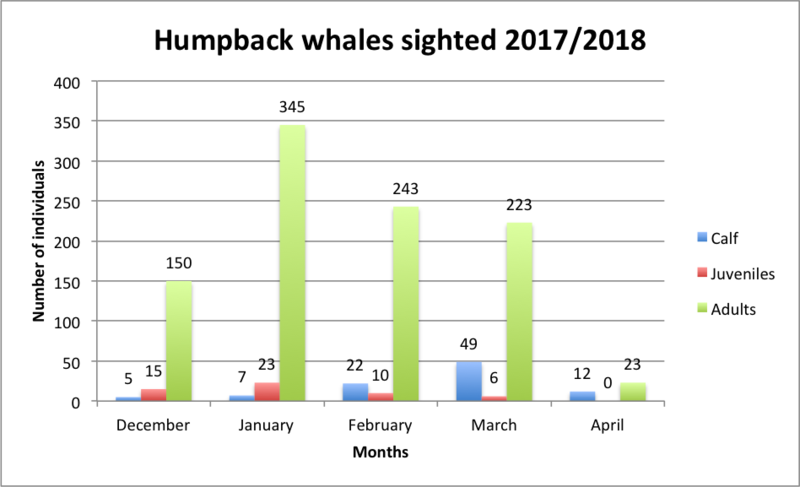 One of the humpback whales sighted this way was also sighted in Cabo San Lucas in March 2017. Want to make the difference? 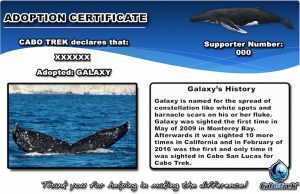 Booking a CABO TREK Whale Watching tour and you will help us getting out there and collect more data. 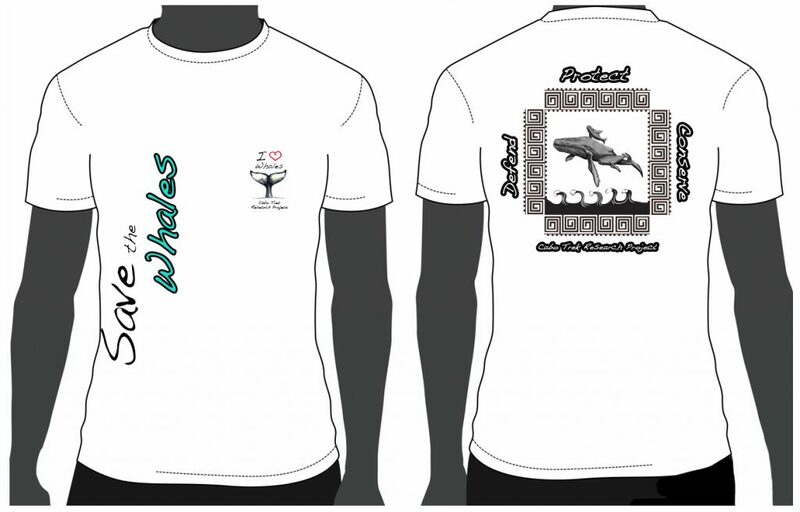 During the booking process as a discounted add-on you can purchase our white colored “Save The Whales” T-shirts. 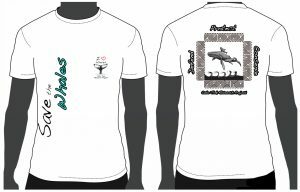 The T-shirt will be giving to you either before or after the tour and we have all sizes available from S till XXL man and S till L women size. Year after year while collecting more and more data about the whales that visit Baja California Sur our whale watching tours become increasingly interesting as our Marine Biologist Guides on Board will share an unmatched great deal of interesting facts that make our tour very special! Have you ever thought about adopting a whale? Well, you will not be able to take it home obviously, but you will receive a nice card with a picture of the fluke telling you interesting facts about the life of the whale you choose, and you will be updated when new sighting will occur in the future. 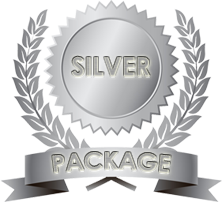 You can choose between the “SILVER”, “GOLD” and the “PLATINUM” (*) package, the differences are explained in the boxes below. Note: *PLATINUM Package only available for guests who actually visit Cabo and join a Cabo Trek Whale Watching Tour which can be purchased as an add-on with a 20% discount when adopting a whale PLATINUM Package. 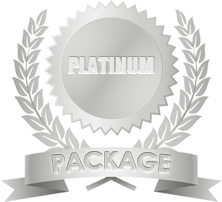 *Note: the PLATINUM package is only available for guest who actually visit our shop in Cabo San Lucas. 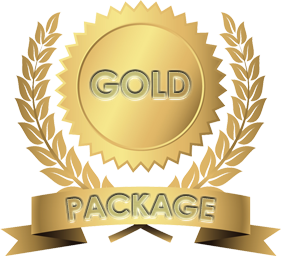 If you’re not coming to Mexico you still can adopt a whale but please choose the “SILVER or GOLD” package as shipping out of Mexico is not easy.